Tower Brass Quintet | McGinty Music, LLC. For thirty five years the Tower Brass Quintet has creatively and progressively shaped their reputation as a premier chamber music ensemble, delighting a broad spectrum of audiences with their unique style of programming and performance. 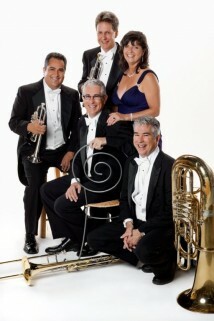 Critics and presenters have consistently praised the Tower Brass for the innovative nature of their concert repertoire, their superb musicianship, and their engaging stage presence. Each Tower Brass concert program is thoughtfully planned to offer the audience a blend of entertainment and discovery and is skillfully presented by five gifted and versatile performers. Tower Brass concerts and recordings have been heard on National Public Radio’s All Things Considered, the American Composer’s Alliance Series, Voice of America, Hungarian State Radio and WNCN in New York. A favorite of local audiences, they have performed numerous times on “Live from FM 91,” (WGTE) the NPR station in their home base, Toledo, Ohio.